Detailed on designer Philippe Starck’s site, the MyWorld sofa is part of a new generation of furniture that’s been specifically designed for the consumer that owns multiple mobile devices such as a laptop, smartphone and tablet. 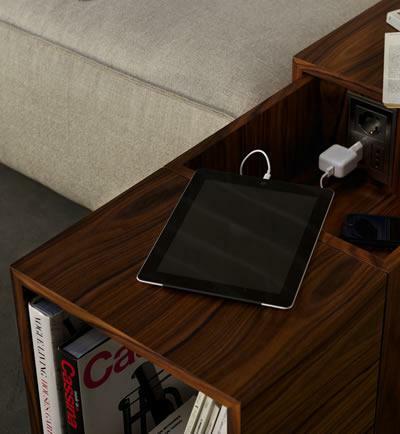 A wooden cabinet on the right side of the sofa contains an electrical outlet for a laptop power supply or AC adapter for a mobile device. It also includes a couple USB ports for a direct connection to a power source in addition to a Duracell wireless charging mat hidden away in the drawer. Mounted on a sliding roller, the cabinet unit also doubles as a open shelf for books or other items. 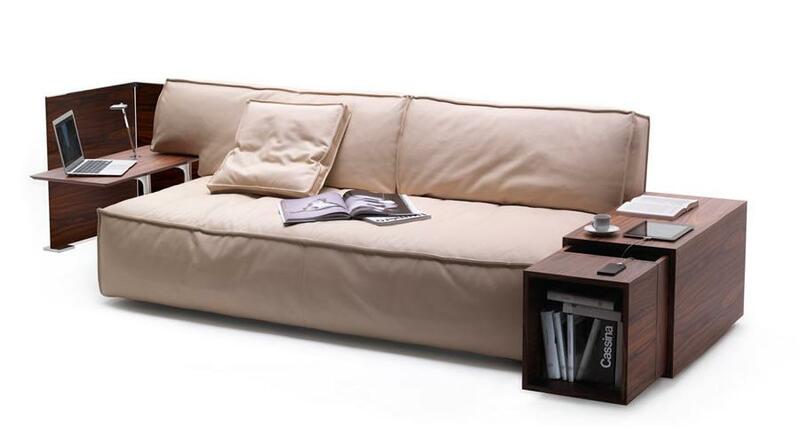 On the left side of the couch, Starck has included a small workspace ideal for a thin ultrabook or tablet. There’s also an included reading light in case the owner wants to dig into a paperback or one of the first generation Kindles without the back light. In addition, matching privacy screens can be ordered along with the couch in order to keep people’s straying eyes off your laptop or mobile device. Sporting a modular design, the MyWorld line of furniture is available in a single armchair, a chaise lounge, a two-seat sofa and a full three-seat couch. Multiple pieces can be placed together to build a larger seating area and the furniture can be covered with fabric or leather. The wooden pieces on either side of the furniture are available in oak or rosewood as well as a variety of colors. In addition, the privacy screens can match the color or the owner can go for a leather or wicker design. The new line was debuted in Italy during April of this year, however there’s no information on pricing for European or American audiences.